“Web accessibility” simply means making your web site accessible to anyone using the Internet. These users may or may not have physical disabilities. They might not see the difference between the colors green and orange. They cannot read small texts. They cannot hear the sounds in your site. Their computers still belong to the “Medieval Ages” of the nineteen nineties. Their Internet connection is still 56kbps. They might have difficulty in using the mouse or just plain keyboard lovers. They are in a hurry and want to go directly to the juicy stuff in your web site. Whoever these persons are and whatever their needs are; we must satisfy them so that they can fully access information from our web sites. We must not put any barriers or restrictions on our web site in order for these persons to experience their viewing pleasure. After accepting the mandate of establishing the web accessibility adhoc group from the government and fresh from the "Webmasters Interface Workshop" held at Cebu City in May of 2006, a team of web designers formed a group and held its first informal meeting at the conference hall of the National Council on Disability Affairs in August 11, 2006. 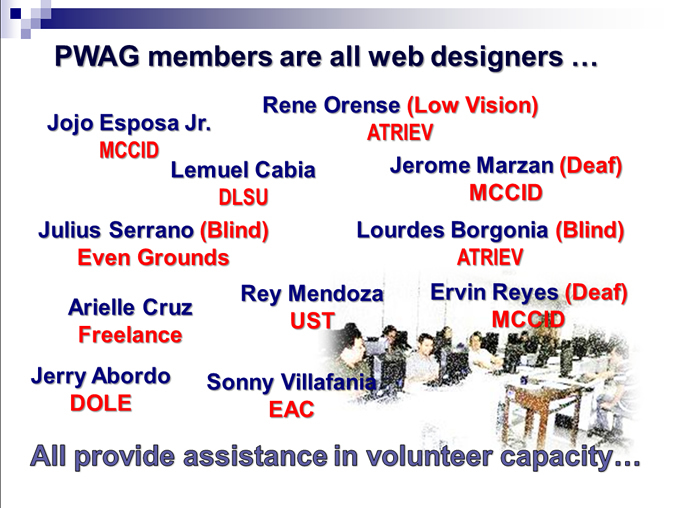 The group agreed to adopt the name Philippine Web Accessibility Group or PWAG. 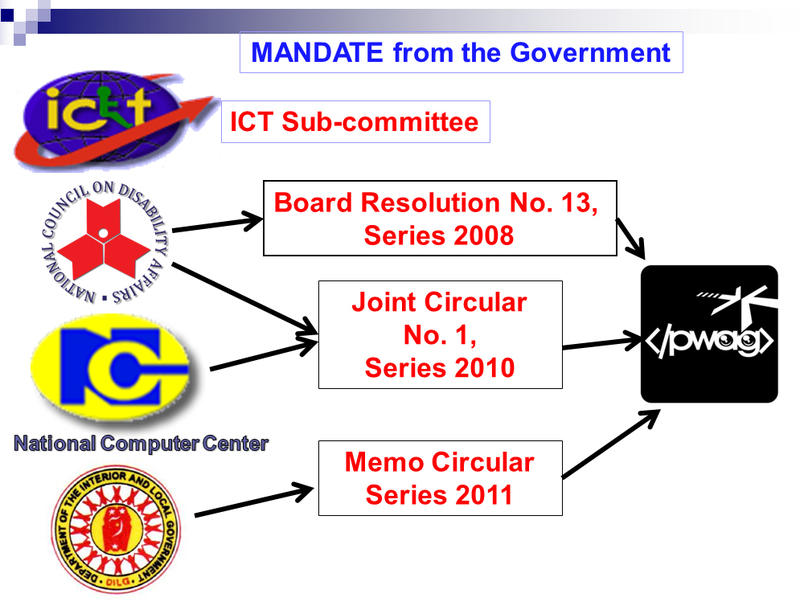 As a government supervised group through the Department of Social Welfare and Development-National Council on Disability Affairs (DSWD-NCDA) and the National Computer Center-Commission on Information and Communications Technology (NCC-CICT), PWAG is also tasked to oversee and implement relevant programs on accessible ICT in the Philippines. 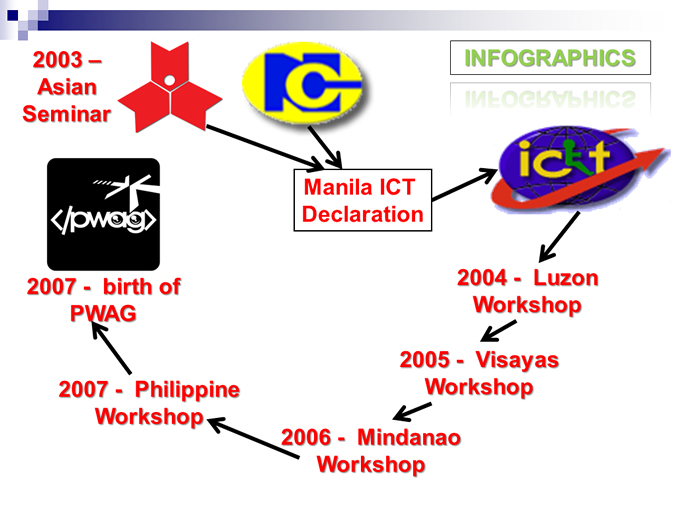 Birth of PWAG from 2004 Luzon, 2005 Visayas, 2006 Mindanao and Cebu conference. Lourdes B. Borgonia – She is the blind web designer of Adaptive Technology for Rehabilitation, Integration, and Empowerment of the Visually Impaired (ATRIEV) Web site. Lemuel B. Cabia – He is the senior web designer of De La Salle University (DLSU) Official Web site. Carlo Josef M. Costales – He is one of the web designers of the government’s House of Representatives. Remberto I. Esposa Jr. – He is the web designer of Manila Christian Computer Institute for the Deaf (MCCID) Web site. Reynaldo B. Mendoza Jr. – He is previously one of the web designers of De La Salle University and is now with the University of Sto. Tomas web development team. Ervin R. Reyes – He is the deaf web designer of MCCID Online web sites and other sites designed by MCCID students for free. The members were a mix of people working from the government, academe and the disability sectors. Ms. Nelia De Jesus and Mr. Dandy Victa representing the National Council on Disability Affairs (NCDA) – NCDA is the government agency tasked to formulate policies and programs for Persons with Disabilities (PWD) in the Philippines. Ms. Grace Amberong representing Commission on Information and Communications Technology – National Computer Center (CICT – NCC) – CICT-NCC is the government arm tasked to facilitate the development and implementation of a Government Information Systems Plan (GISP), in order to accelerate electronic governance in the country for greater productivity, give wider access to public information and provide for the faster delivery of basic services. Mr. Leo Valdes representing Vision Office Support Services, Ltd. – Canada based Vision Office aims to empower users and organizations through management training, support, and implementation services. Ms. Mel Pedley representing Guild of Accessible Web Designers (GAWDS) – GAWDS is a worldwide association of professional organizations, web designers and developers working together to promote the use and preservation of accessible design standards. 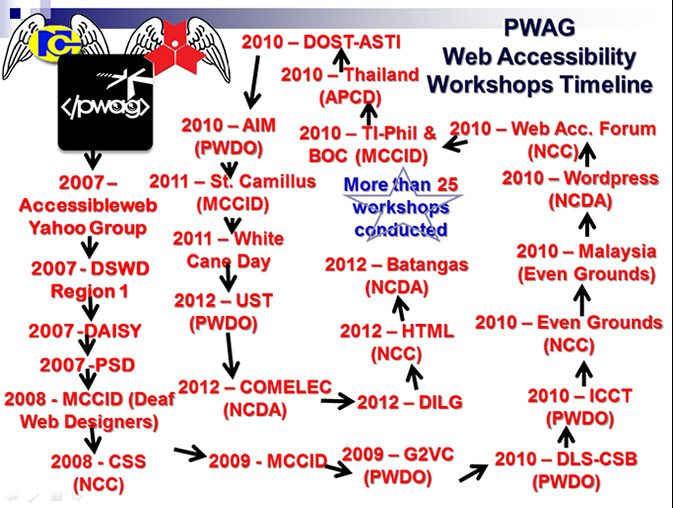 PWAG is slowly but surely putting its weight in shaping the information and communications technology climate in the Philippines by promoting web accessibility and helping in the designing of web standards. 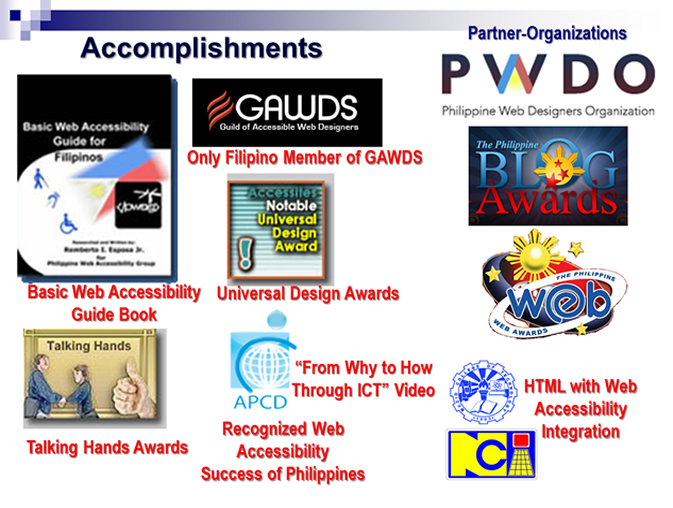 To view the comprehensive history of Web Accessibility Initiatives in the Philippines, please visit the Wikipedia article http://en.wikipedia.org/wiki/Web_Accessibility_Initiatives_in_the_Philippines.